Apple today unveiled OS X Yosemite, the next major version of their Mac operating system. Introduced by Apple's Senior Vice President of Software Engineering, Craig Federighi, Yosemite brings a big new redesign to the Mac that is reminiscent of last year's iOS 7 redesign. Continuity between OS X and iOS is also a huge aspect to the Yosemite release, including a so-called 'Handoff' feature, instant hotspots, and support for making phone calls and sending text messages from a Mac. Beyond that, Notification Center now includes the 'Today' view from iOS (with support for widgets), a brand new 'Spotlight' and big improvements to Mail, Safari and the new iCloud Drive. Taking strong cues from last year's iOS 7 redesign, Yosemite removes a lot of unnecessary window chrome and pumps up the translucency. The dock is no longer a 3D platform, but a semi-transparent rectangular square that blurs the wallpaper. Apple's Mac app icons are now a little flatter, and a bit simpler - but there is still a mix of round-rectangles, circles and other shapes. Apple has even brought a dark mode to Yosemite, allowing you to switch from a translucent white theme to a translucent black theme (similar to the Private mode in iOS 7's Safari). But you really have to see the design to understand it, so here are a few screenshots. In addition to being redesigned to fit within Yosemite's new look (translucent black, blurring the desktop wallpaper), there is now a new 'Today' view. Just like the Today view in iOS, you will now be able to get a rundown of everything happening today for you. You get a glance of your calendar, reminders, stocks, weather and more. Importantly, it also includes the support for widgets such as a calculator, and you'll be able to get more widgets as developers create them for their Mac App Store apps. The new Today view in Notification Center gives you a quick look at everything you need to know with widgets for Calendar, Weather, Stocks, Reminders, World Clock and social networks. 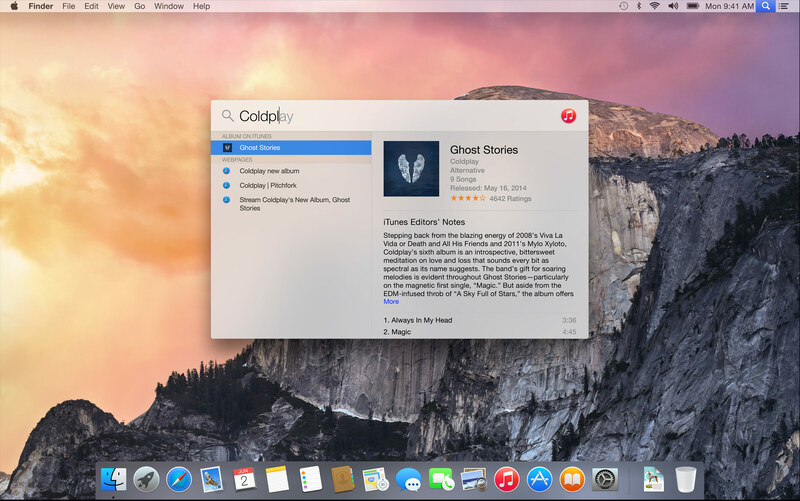 You can even download additional widgets from the Mac App Store to customize your Today view. Spotlight has now been moved to the center of your screen, in a design similar to Alfred and Quicksilver. But the changes are more than face deep, with support for large inline previews and external data sources. Those external data sources include support for Apple Maps, iTunes Store, Wikipedia, movie showings, and a number of news sources amongst others - all of which also support for the inline preview. For example, you can search for a restaurant right from Spotlight, view it in the inline preview even including any Yelp reviews. Spotlight® now appears front and center on your desktop and adds new categories of results, so you can view rich suggestions from Wikipedia, Maps, Bing, App Store, iTunes Store, iBooks Store, top websites, news and movie showtimes. A big aspect of the presentation was highlighting new features that provide greater continuity support between the Mac and iOS. There were a few key aspects to this including 'Handoff', instant hotspots, and the ability to send SMS text messages and make phone calls from your Mac. In Federighi's words, they wanted to promote the ability to use "the right device for the right moment". The idea behind the Handoff features is to improve the continuity when transitioning from using an iOS device to a Mac, or vice versa. So for example, if you are composing an email in Mail on an iPhone and you approach your Mac, OS X Yosemite will add an icon to the dock that allows you to finish composing the email on your Mac. This new feature works both iOS to Mac and Mac to iOS. On iOS, the Handoff icon will appear on the bottom left of the Lock screen. This isn't specifically a new feature, but a greatly improved one. Now, OS X Yosemite will be able to automatically hotspot off an iPhone or iPad cellular connection with one-click. All it requires is the iOS device to be nearby - no passwords, no setup (presumably just working from iCloud accounts and Bluetooth). 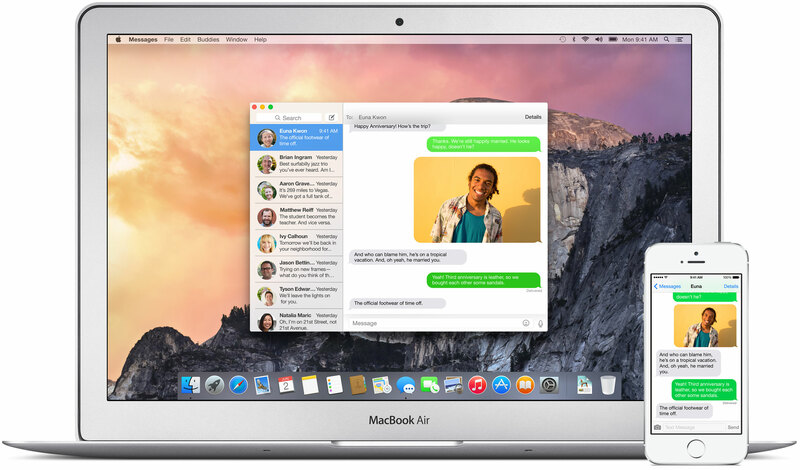 Messages on your Mac can now receive and send SMS messages via your iPhone. The iPhone acts as a relay between your mobile service provider and your Mac, allowing you to seamlessly send messages to others who don't have iMessage. 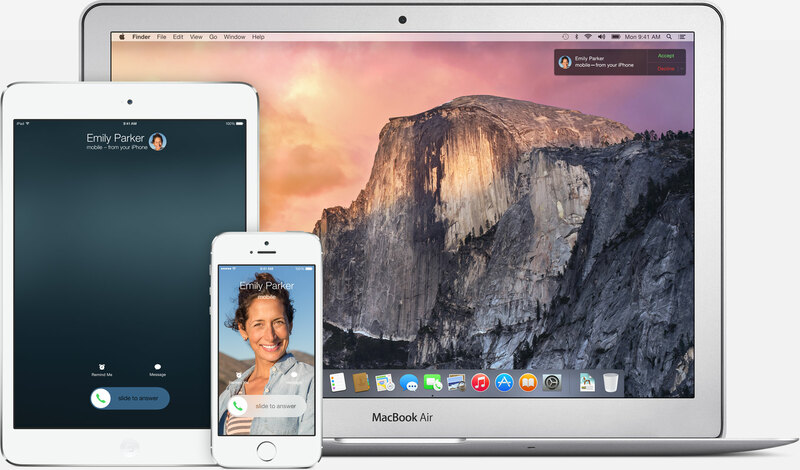 Perhaps even more impressively, you can now even make and accept phone calls on your Mac. Don't worry about your phone being charged in another room whilst you are working on your Mac, simply accept the call and your Mac will work as a speakerphone. Similarly, you can even start a phone call on your Mac, right from Safari, Contacts and other Mac apps. 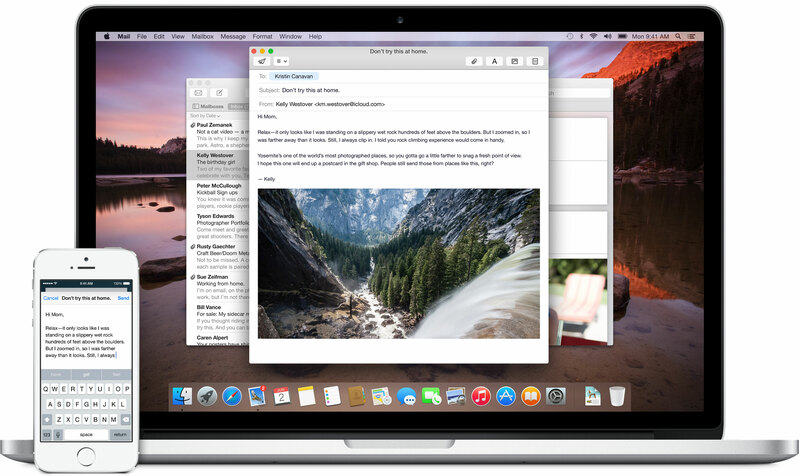 Mail in OS X Yosemite has supposedly seen improvements to the basics of reliable syncing, fast account switching and quick fetches of new mail. But beyond that, and the expected UI refresh, it has a new Mail Drop, and Markup features. Within Mail, it allows you to circumvent the common email problem of sending large attachments. Mail will allow you to upload documents, such as large videos (up to 5GB), to iCloud and recipients will be able to view the attachments like normal (if they are using Apple's Mail app) or as a link (if using 3rd party apps). 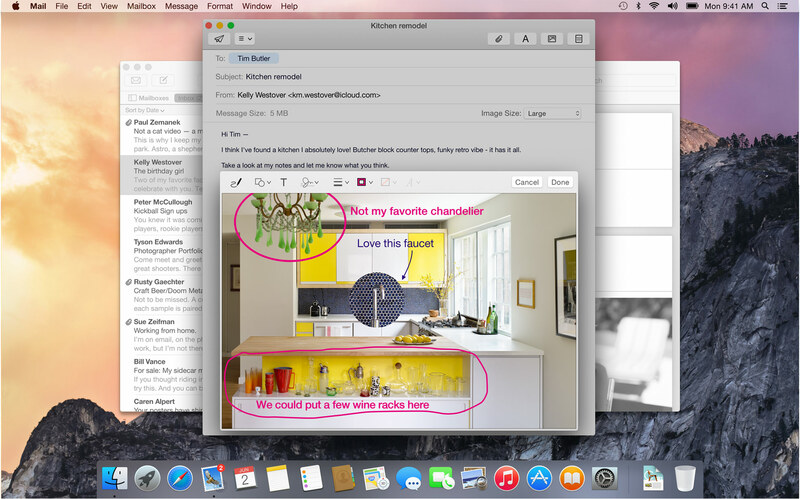 Also included OS X Yosemite's Mail app is a new markup feature. This brings some Preview-esque features right into the Mail app, allowing you to annotate, draw and sign images and PDF documents from within the compose window. It'll even recognise when you are drawing an arrow or callout bubble with your trackpad and automatically convert that scribble into a clean vector annotation. 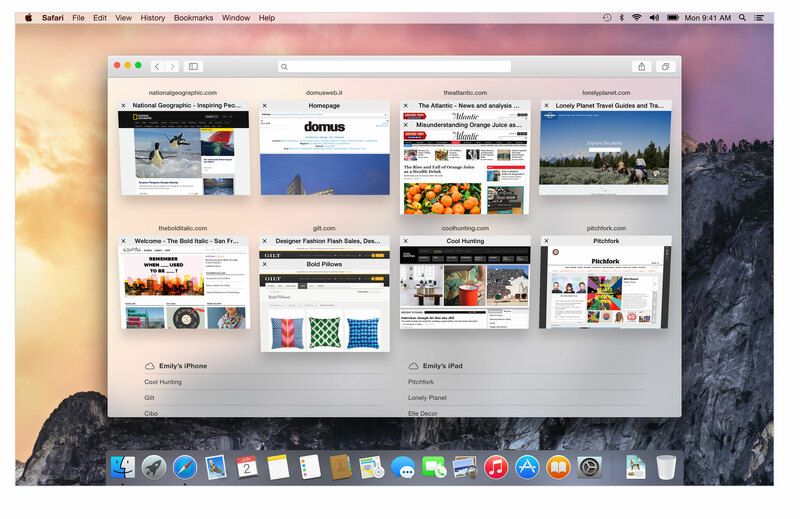 Safari in OS X Yosemite brings a refreshed user interface and four key features: powerful smart search options, improved sharing options, new tab views and improved standards support. Running through each of those briefly, perhaps the most exciting is the new smart search bar, which incorporates many of the new features that Spotlight does - allowing you to preview popular search items. That search bar also contains your favourites: simply tap on it and a dropdown box will display all your favourites. Moving to the sharing options and you can now subscribe to RSS feeds into your Shared Links sidebar. When you want to share a link to something, Safari will remember the recent people you have sent links to, and display them so you can quickly do so again. As for tabs, there is a new birds-eye grid view that allows you to view all your tabs at a glance, and if you have multiple tabs open from the same website, they'll be stacked on top of each other. But they haven't removed the normal tabs, and in fact Apple has improved them. Now, if you have many tabs open (such that you can't even read what all their titles are), you can scroll along them to expand the tab to fit the title. Last but certainly not least, Apple has stepped up Safari's compliance with standards and even introduced some new features such as HTML5 Premium Video which will supposedly let you watch Netflix and other video services without a plugin - allowing big savings on battery (Apple claims two hours). 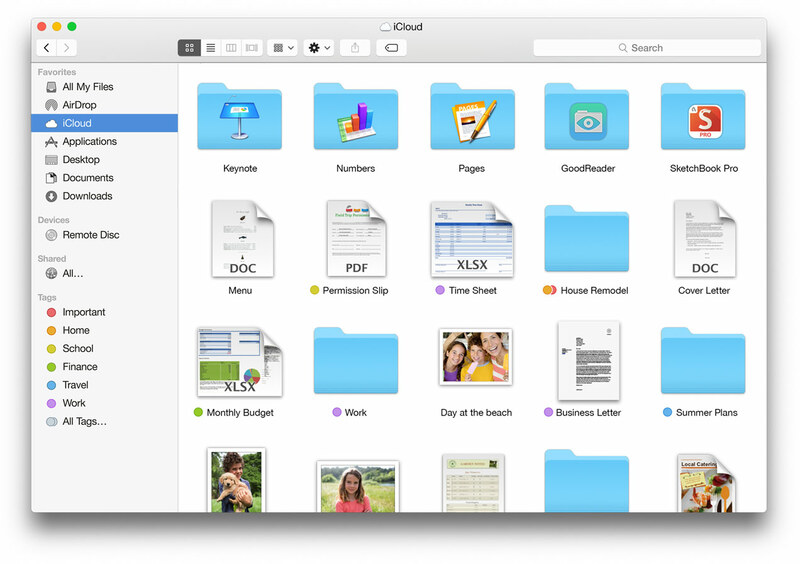 iCloud Drive is a new feature that is included within Finder in OS X Yosemite. It allows you to not only view what is being synced with your iCloud account (think of Pages documents or Keynote documents) but also sync all your Mac documents with iCloud, making those documents accessible to any apps the support iCloud Drive. AirDrop now works between iOS and Macs. Enough said, right? Now you can send documents, images and a lot more, easily between nearby colleagues, even if they're using a Mac and you're using an iPhone. 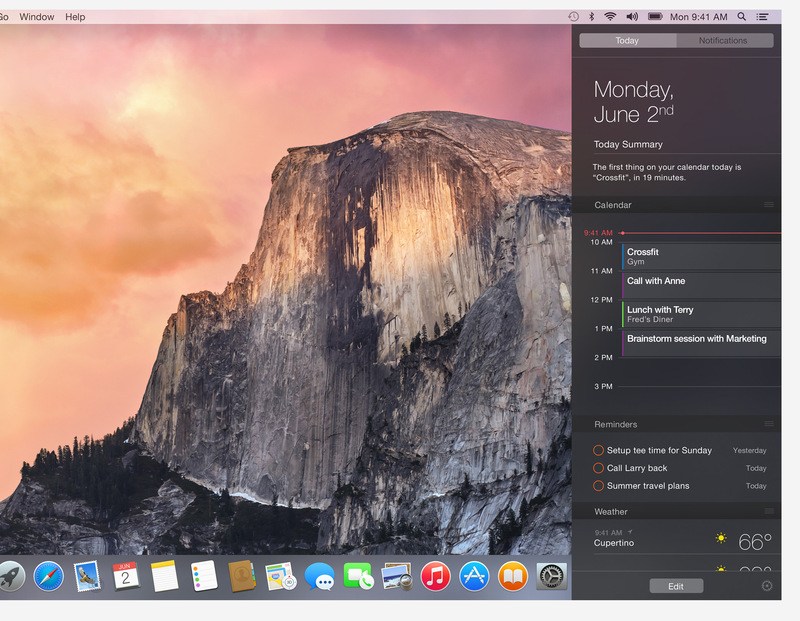 A developer preview of OS X Yosemite will be available to developers today. Apple will also be running a public beta program of OS X Yosemite, where anyone can sign up to be a part of the program and help Apple improve the update. OS X Yosemite will be available to everyone later this Fall, for free.